Walking down the chic Rue St Honoré, it is easy to walk right by Astier de Villatte’s flagship store. The narrow store front of this ceramic table top emporium looks in need of a good clean up. The ultimate in shabby chic, one encounters a 19th century little shop that time forgot. Entering is to step back in time. The store’s dress is one of years of wear and vestige of grunge left from Paris’s coal fired past. 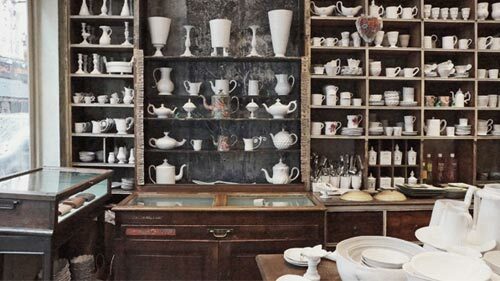 Within this grey and unwashed backdrop more fitting for a “Les Misérables” production than a chic salon, the firm’s classic rustic white vessels show so well. Astier de Villatte makes rustic ceramics with such fine line and subtlety of design that the pieces can elevate the simplest table into a meal in the countryside of a by gone era. In the States, the Sue Fisher King store in San Francisco has a great selection of these wares. The photos here were shot with a state of the art mirror less camera, the Sony Nex-7, using available light. The hi-res interior photos were adjusted in Photoshop correcting the bowing effect of a wide angle lens, adjusting contrast and the photos were desaturated to give an vintage feeling. The photos were also collaged together in a crop 2/3 plus 1/3 wide proportion to add a graphic element to the post to better tell the story in overall room shots and details. 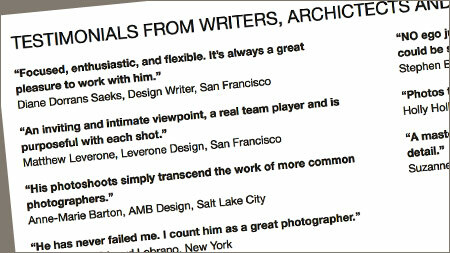 David Livingston photographs interior vignettes for magazines and interior designers in Paris and San Francisco. Livingston uses natural light to make pretty pictures of homes. He art directs the photography and the interior styling, takes the photos and oversees the post-production of the final photographs.